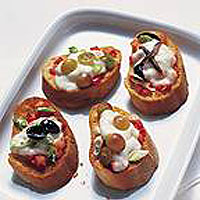 Bruschetta is a popular Italian starter or snack made from toasted crusty bread topped with tomatoes. Preheat the grill to high and toast the bread on both sides. Allow the bread to cool slightly then lightly rub each slice all over with the clove of garlic. Place the slices of toast onto a baking tray and drizzle the olive oil over one side, then carefully arrange the pieces of tomato on top. Season with salt and pepper. Top with a slice of cheese and your choice of toppings. Place in a preheated oven 200°C, gas mark 6 for 5 minutes until the cheese has just melted. Garnish with the basil and serve immediately.